Well vectored but the BG is far to real so the overall impresion suffers because of that. If the BG were more animelike it would sure be a great wallpaper. You could try editing the background a bit with filtering and opacity to make it look less garish. The vector looks great. Nothing to criticize about it, really. But as it has already been said, I'd change the BG. 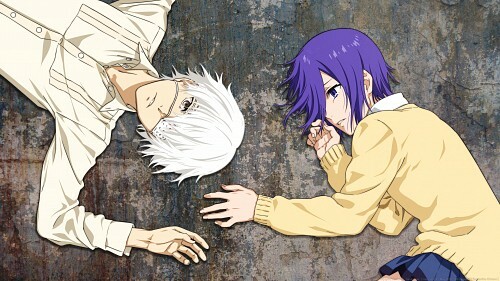 The characters don't have many lively colors on them except for Touka's hair so I'd go for a more vibrant BG, maybe vivid green grass or a colorful carpet with some intricate pattern. OR if you want to keep the same feel as in the original scan, I'd use some grunge texture on the characters as well to merge them with the BG more. Although, tbh, I don't like how the original scan is done. The BG doesn't suit it at all. Still, you did what you could and overall, you did a fine job. Keep it up!